AMD reported earnings after the close on Tuesday and despite missing on revenue the stock popped by 16% from Tuesday's close to Wednesday's early high of $22.40..
Advanced Micro Devices Inc (AMD - Get Report) reported earnings after the close on Tuesday and despite reporting a revenue miss and offering expectations below consensus, the stock popped 10% from its session close of $19.25 to the after-hours high of $21.34. Wednesday's early high of $22.40 extended the breakout to 16%. The stock closed Wednesday up 19.95% to $23.09. The semiconductor company cited an excess inventory of graphics chips, which would normally drive the stock down big time. This risk was already priced-in as AMD was already down 43.8% from its 2018 high of $34.14 set on Sept. 13. More important is the bull market gain of 20.1% since setting its Dec. 24 low of $16.03. This gain is now close to 40%. Investors were comforted by the company's full-year 2019 outlook that included upbeat comments on their next-generation of semiconductor components for PCs, data centers and servers. The daily chart for AMD shows that the stock has been close to a "death cross" formation that now seems less likely as the stock has been rising along its 200-day simple moving average higher since Oct. 29 with the average now at $19.51. Note that when the stock traded as low as $16.03 on Dec. 26, it closed that day above the Dec. 24 high. This is called a "key reversal" favoring higher prices. The 2018 close at $18.46 was the input to my proprietary analytics and resulted in the three horizontal lines shown on the chart. The stock was staged between my semiannual and quarterly pivot at $18.76 and $20.42, respectively, pre-earnings which is my buy zone. The upside is my monthly risky level at $29.82. 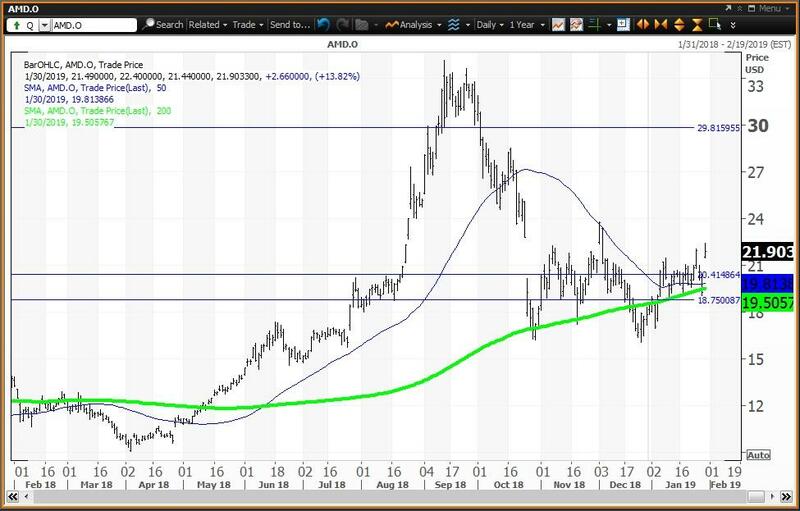 The weekly chart for AMD will be positive if the stock ends this week above its five-week modified moving average of $20.65. The stock remains well above its 200-week simple moving average or "reversion to the mean" at $9.96. 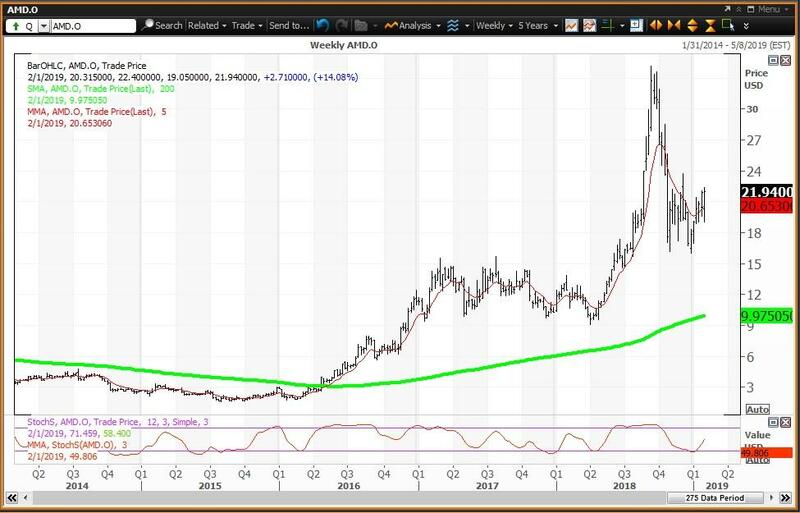 The 12x3x3 weekly slow stochastic reading is projected to rise to 49.80 this week up from 38.98 on Jan. 25. Trading Strategy: Given these charts and analysis, investors should buy weakness to my quarterly and semiannual value levels at $20.43 and $18.76, respectively, and reduce holdings on strength to my monthly risky level at $29.82.